On Friday 25th May, members made their way to Frome RFC for the annual dinner and award ceremony. Frome Rugby Club was the venue for the event, for the second season in a row. We are grateful to Frome RFC for the effort they have made to make us feel welcome and the work they put in to presenting the room and tables to make the event a special evening. All members and their guests all arrived in their dinner jackets and posh frocks, yes referees do scrub up well!!! The event started with member Dave Mealing, who compered the evening, welcoming all to the dinner and before guests could even tuck into their starters they were given a verse from a great rugby league poem. This was given in a great northern accent by Dave himself, who decided it would be a great idea to do it between each course! Following the dinner the society received an enlightening talk guest speaker, His Honour Judge Jeff Blackett, who spoke about many of his memories of being head of disciplinary hearings over many seasons as well as other rugby stories. T he evening then moved on to what many members were looking forward to…It was time for the awards ceremony. The first award, given out by society Chairman, Bruce Marshall, was the ‘Bell Trophy’ which is awarded to the most hospitable club within the county. The award is decided by members and this year Chard RFC came away top of the tree. Bruce moved onto something very special, a moment not many members have previously seen before, it was time for some Honorary Life Memberships to be awarded. Previous Chairman and current head of finance, Barry Malpass, was first to be given such a prestigious award. Barry has been with the society for many a year and some wouldn’t know the society without him being around. The second long standing member to receive recognition was our former Society Adviser Development Officer, Harry Vince, who has also been a member of the society for many years and many referees have developed thanks to his great guidance as a coach. That wasn’t the last award to be given out to Harry Vince that evening as he also was chosen to receive the Jenny O’Connell Award, an award named after the societies previous treasurer who passed away during the season. The award was given to Harry by Jenny’s Husband, Rory, with Harry being selected by the society Chairman, Vice Chairman and President to receive the award for all the many great years he has put into the society. Bruce then invited HHJ Jeff Blackett to stand up with him to award the members trophies of the season. 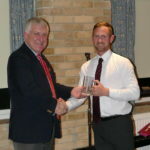 The first winner of an award was Matt Turfrey, winning referee of the year, who has given 100% all season with his fitness and refereeing to improve his level and is now level 6 looking to push to level 5. Matt was given a personal training plan by fellow member Tom Evans-Jones to push himself all the way to make sure he could reach his aim of being level 6 by the end of the season. The next worthy winner of an award was Dan Evans who won Dave Smith Memorial Trophy named after a former society group assessor and given to the most improved referee. Dan, who put so much hard work in over the season with coach Reg Lewis to make sure he improved from a low level 9 to a high level 8 referee, unfortunately couldn’t attend the dinner and award ceremony but the award will given to him at the first training meeting of next season. Next up was Academy Referee of the Year, this is given to a new referee who started this year or a member who is under the age of 18, this years’ winner was Lloyd Davies who joined the society back in September. Lloyd is an all-round sportsman, he was previously the captain of the first XI at Bath CC and is a PE teacher in B&NES. Lloyd has had a fantastic season and we expect great things from him in the future. The final award given out on the evening was to Laurence Beere, the society recruitment and retention officer, for member of the year. Laurence has put in many hours behind the scene to develop a new website for the society, making a YMO plan and changing the face of the society. The final things to be handed out on the evening were the society 100 game ties, given to any referee who has refereed 100 games for the society over the past 3 seasons. The tie was given out to 4 members on the evening with 2 still to receive their tie at a society meeting in the near future. The ties, given to winners by Dr Tim Miller the RFRU RFU council member, were award to Brian Perry, Wayne Davis, Nick Heath and Harry Garmston on the evening with Stephen Potter and Paul Kendall receiving theirs at the beginning of next season. A tie was also given to young member Warren Bowditch for joining the society as a YMO and also all the hard work he put in on the evening to sale raffle tickets and make sure everyone was sat in the correct seat. The society would like to thank Laurence Beere for putting after dinner speaker Jeff Blackett up in his hotel, The Queensberry in Bath, overnight and also all members that gave raffle prizes to raise money towards Duncan Fisken’s Rwanda Trip.